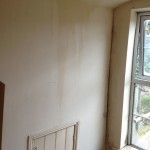 Condensation occurs when ventilation within a property is insufficient to meet moisture production. Airborne moisture is commonly expressed as a %relative humidity (RH). 100% RH results in moisture being displaced from the air onto cold surfaces. Mould growth requires 70-80% RH. An alternative measurement of airborne moisture is vapour pressure. Condensation occurs on cold surfaces when the localized air temperature is lowered to its dew point temperature. As warm air approaches a cold surface it cools and contracts leaving it less able to hold moisture. Relative humidity therefore increases as air cools. 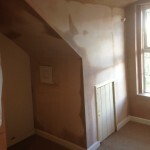 To prevent condensation it is necessary to ensure ventilation is able to deal with the rate at which the air is cooling. Alternatively, cold surfaces should be insulated to reduce the rate at which the air is cooling and allow ventilation to remove the damp air. 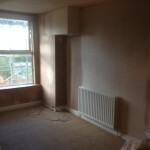 Where ventilation is increased this should be with the minimum of heat loss. Heat recovery ventilation or insulated passive vents are suitable for condensation control. A dehumidifier can be used where it is impractical to improve ventilation. 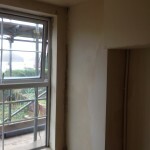 Mould growth often occurs as a result of condensation. Health problems are increasingly being associated with mould growth and it is therefore important mould growth is removed in a controlled and safe manner.